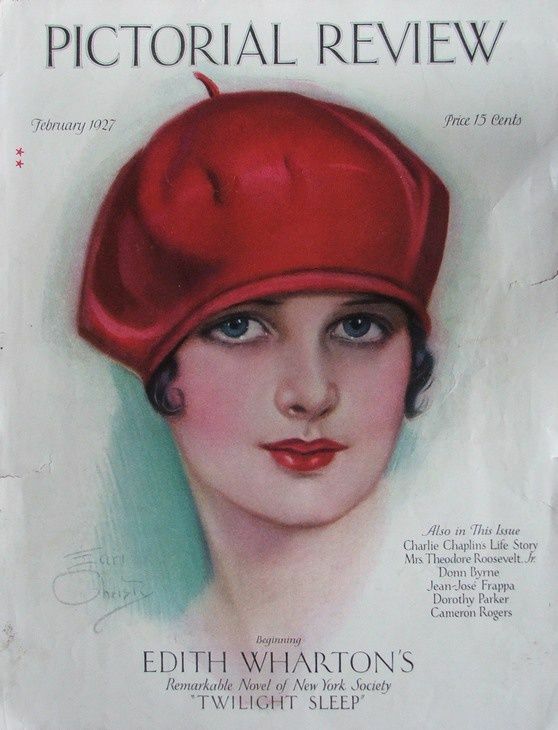 Another vintage cover! I'm really pleased with myself for doing three this month. although there was still one more that I really wanted to attempt. Oh well, next time! 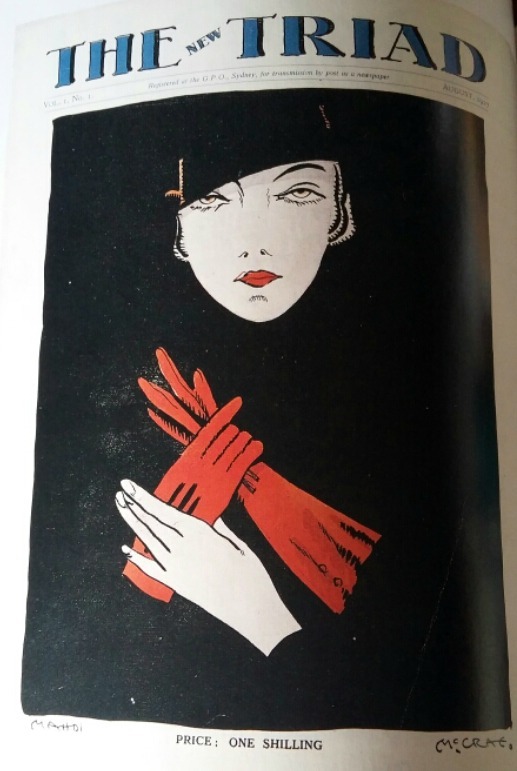 This was one I spotted in a book I borrowed this month from the library (you would have seen about it in the newsletter if you are a subscriber), called "Cover up: the art of magazine covers in Australia" by Robert Holden. It has lots of great Australian covers that I hadn't seen before, and this one really caught my eye. The editing on this one was actually much easier than the others. 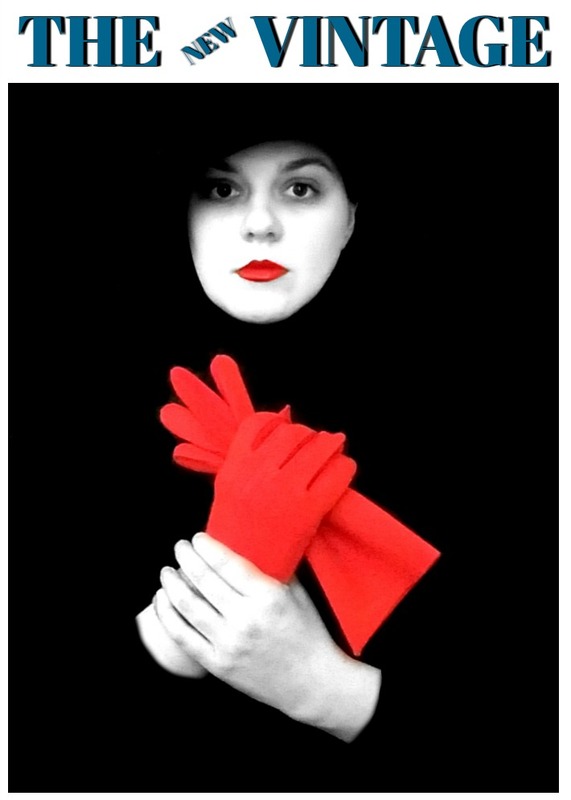 Most of it was playing with the details of the black and white filter and removing the effect on the gloves and lips. I'm not much of a make-up person, but I wanted to get that drawn outline look on the lips so I actually used eyeliner. Which made me look crazy, and it didn't even show up in the end! Luckily only the baby saw me like that, and it was his fault for waking up, really. 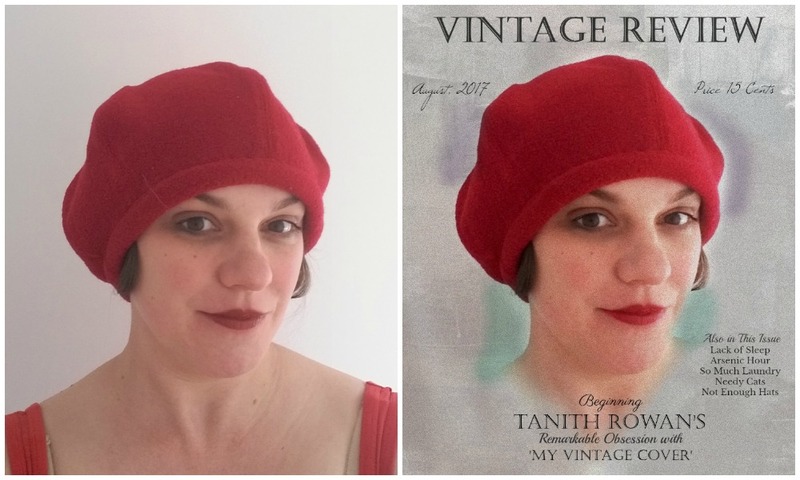 If you missed my other covers, there was the yellow polka-dots and the red beret, and also make sure you keep checking the #myvintagecover hashtag on Instagram - there have been some amazing efforts! Thank you everyone who has joined in or supported those who have with your encouraging comments. 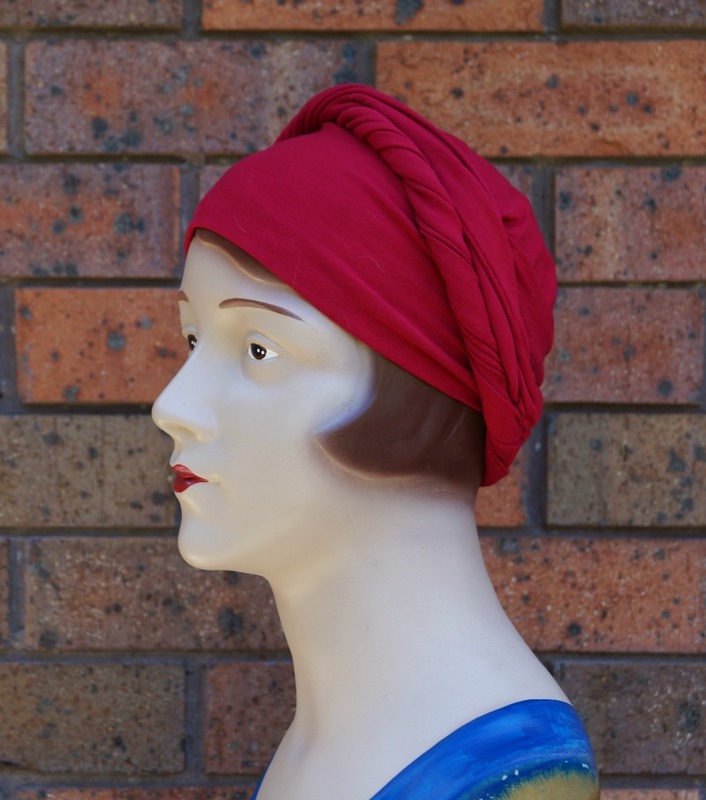 Trove Pattern Project - A 1930 "Smart Little Turban"
The earliest vintage hat pattern I have so far used is this turban from 1930. I keep thinking of it as 1920s, and it almost is, but we can probably all agree it is at least in a very 20s style. I've seen other very similar patterns shared on Pinterest, but this one is from my great-great-grandfather's favourite newspaper to write letters to, the Brisbane Courier, from the 7th of August, 1930. You can access the original article here. I think it is designed to be tied on and arranged each time you wear it, but I've chosen to sew the draping in place so it is ready to go. I'm not sure this is the best option but it works. You can use either stretch or woven material, a piece at least 16 by 60 inches. If you are sewing it in place as I did, stretch is best. Your choice of fabric will naturally be determined by whether you intend to wear it for "theatre and restaurant wear in the evening" or for "motoring and sports wear during the daylight hours". As always, they don't have all the measurements you might want, but it was certainly enough to work from. The first one I made (the green) was a little small for my 22-22.5 inch head. It does fit, but doesn't sit where I'd like and the fabric stretch is needed. On a friend with a 21 inch head, this size was perfect. For my second attempt (pink), I added an inch or two to the length and width of the rectangle, and an inch or two around the curved edge too. This is a much better fit, but still on the small side, especially as my hair has grown longer. 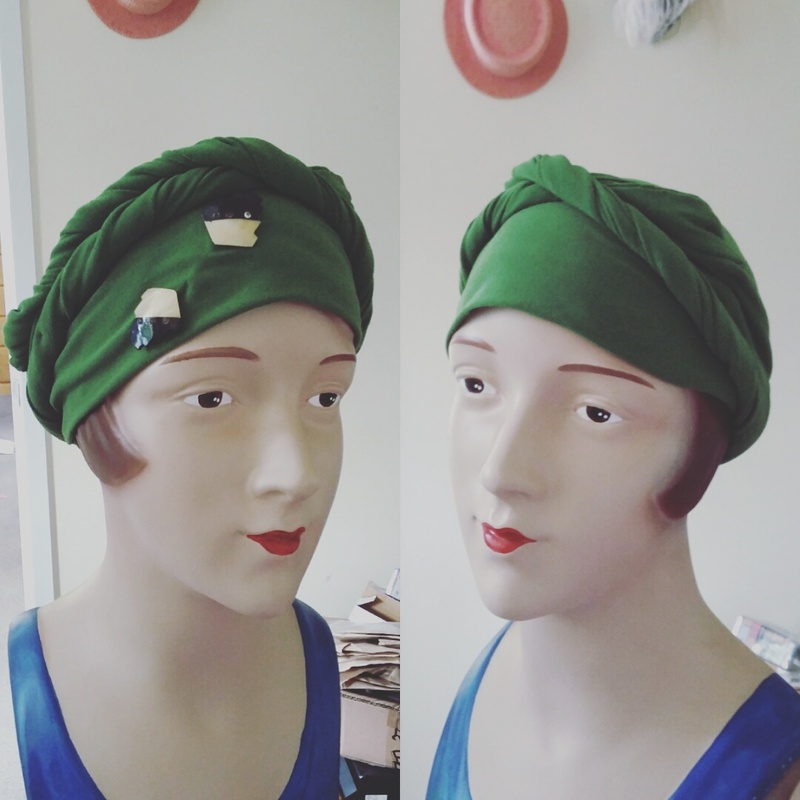 I sewed this turban by hand, as instructed. It was a good in-front-of-the-TV task and didn't take too long. After getting the arrangement how I wanted on the mannequin, I hand stitched it into place at a few points. The instructions were relatively straightforward, and the draping diagrams were actually quite helpful! I'm not completely clear on the different ways they suggest tucking the various bits, but since they assure me that this way, with the ends twisted across the top, is the most flattering to the older woman, that's all I need to know, right? I'm told it adds dignity, and will provide balance for "the somewhat heavier outline of the average matron." Hmmm. If you are good with tying head wraps and scarves, it might suit you better to make the turban and tie it each time. For me, sewing it up seemed like the better option. Still, it requires adjusting when you put it on, and if you were using a non-stretch fabric I imagine that you would want to tie it each time. It's a pretty easy-to-wear item either way, and great for bad hair days/weeks/years. I also like the smooth front section as a place to add a bit of bling, in the form of a hat pin or brooch. What do you think of this one? And would you prefer to wear it motoring or to the theatre? Some, however, were within my current reach, like this one. Despite what I said after my first vintage cover recreation, I'm back with another close up! 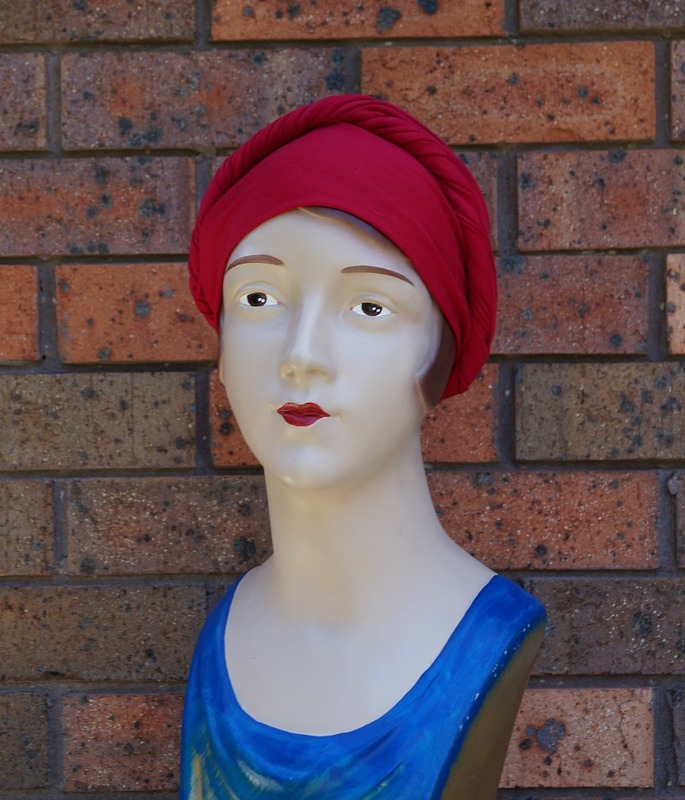 Since I have a red beret (which I love and wear often), I couldn't resist this one. Some people have asked about my photo editing. I did this one entirely with Picmonkey. If you are interested, here are a few details, otherwise skip to the end! For this image I had to play around with editing out the rest of my body and whitening up the background: mostly using the "clone" and "curves" tools, but the fun stuff was getting the magazine-y feel. Obviously the text adds to that, but so does the "film grain" filter. To get the paint effect in the background, I added a painted texture and then removed it from the face and hat (as well as fading it a lot to keep it more subtle). All the effects in picmonkey can be applied to just a part of the image if you like. And then I added the coloured bits in the background. I used the ombre filter but the draw tool would probably be just as good. Plus there was a bit of *ahem* wrinkle removal, eye shadow, lip tint, and using "clone" to remove a cat hair from the hat! Unfortunately a lot of these are tools you only get if you pay to use Picmonkey, but I'm sure similar features are available with other software. I also use Gimp, which is free, and has a lot of great features, but it isn't quite as simple to use. In most of my regular photo editing I only use the free tools like exposure, cropping, resizing and so on. I had fun with this one, but more importantly, I think I could get used to wearing my berets low down like this! What do you think? After making a start on ribbon embroidery, my next learning experience for the year was lace millinery. I finished my first piece using the technique before I had the baby, but I put off sharing the results, hoping to have a nice photo shoot first. That hasn't happened, and I'm already almost finished the second piece using this technique, so I decided to just share anyway! Edie (the mannequin) is a pretty good model, after all. 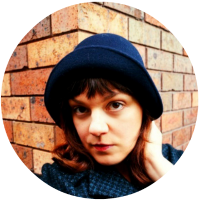 The class is an online one, offered through Hat Academy and taught by Melbourne milliner Brett Morley. 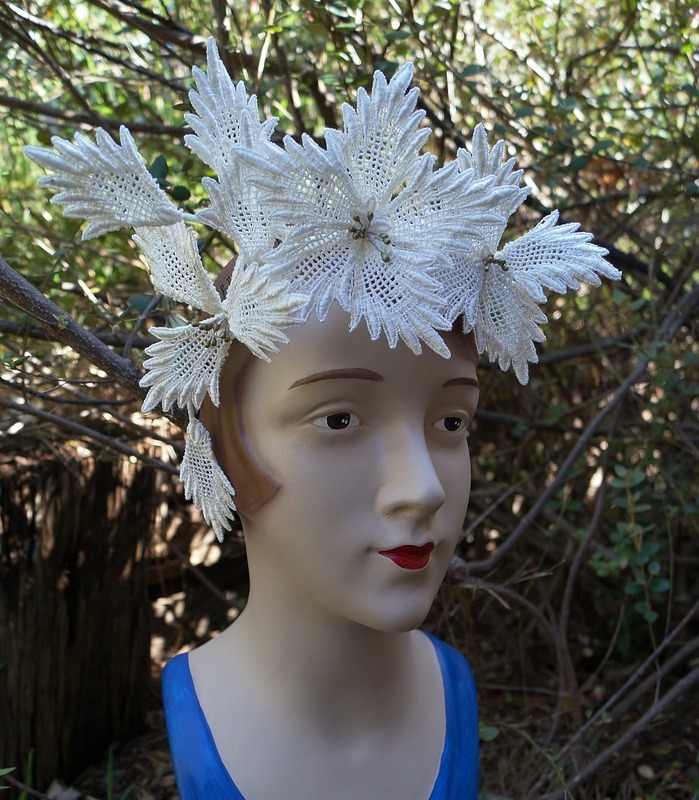 The full Lace Millinery deluxe course is three lessons, and I have actually only bought the first of the lessons (you can buy individually or the whole lot together), Lace Millinery Fundamentals. 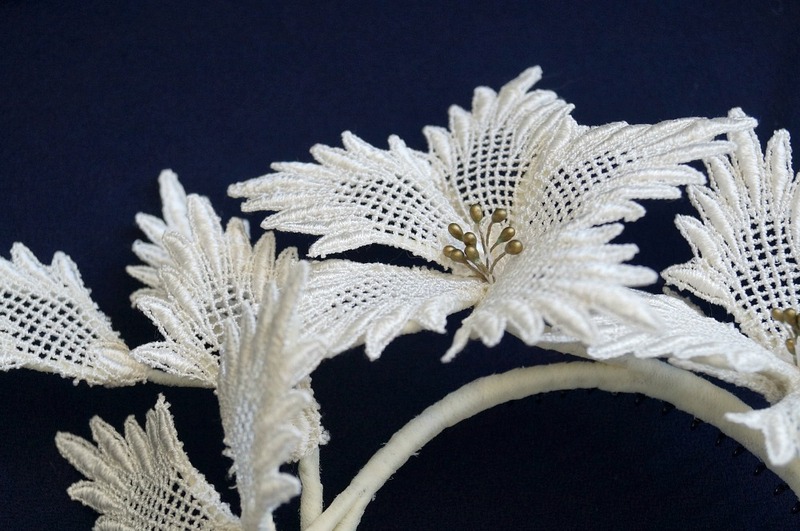 There are many different ways of working with lace in millinery, but Brett's work using these techniques is particularly stunning. He taught this method at the 2014 International Millinery Forum, and I was interested, but didn't end up doing the class. Then I had seriously regret! Ever since I saw this course on Hat Academy, I've been coveting it, and finally decided to treat myself this year. I'm really glad I did. As well as being generally excited to be learning something new, I love the results I achieved on my first try, and I'm enjoying experimenting more. The downside to the method is that it is very slow. 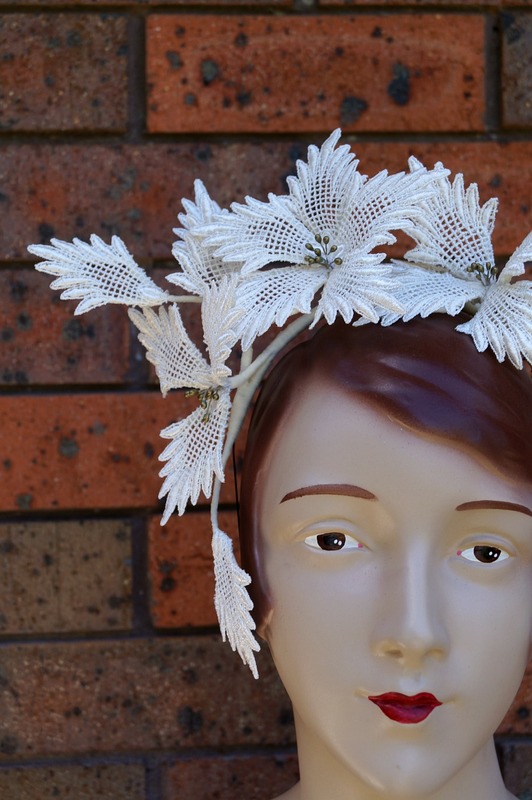 Every piece of lace that you see here as a petal or leaf is individually cut out and sewn on to a wire support. This is extremely time-consuming. On the plus side, it is all hand sewing and able to be made in small increments of time (great for the work-from-home-mum). I did a lot in front of the TV in the evenings and even some at the breakfast and dinner table. I like that the look of the pieces can be very modern and very artistic, but also very vintage and classic. Another plus is that because each petal is wired, they can be shifted and shaped at any point, and altered after making to suit the wearer. 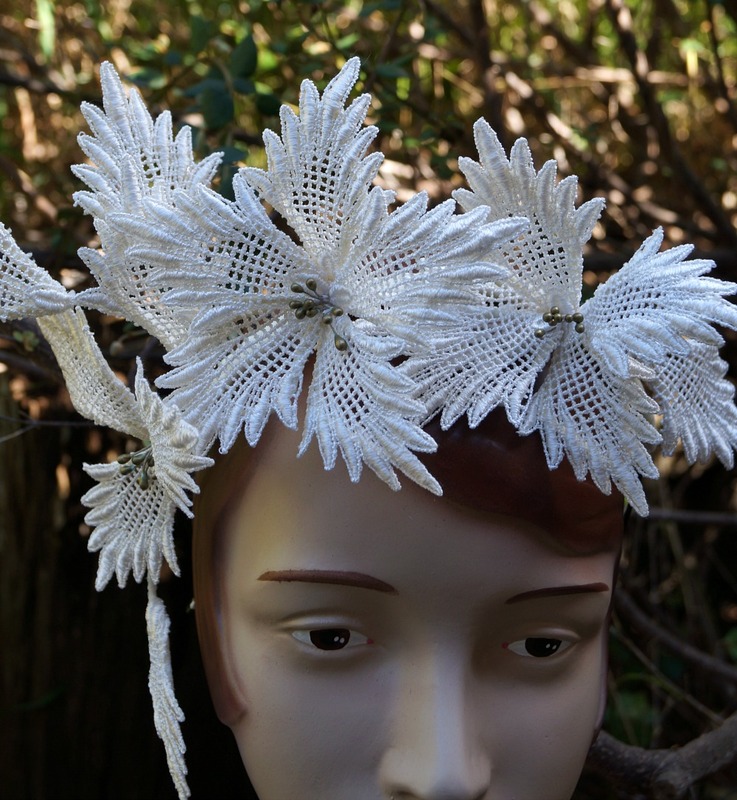 My second lace millinery project is a combination of skills from this class and another from Hat Academy, and I'm really excited to show you that one soon, plus yet another. All these new skills are very exciting! 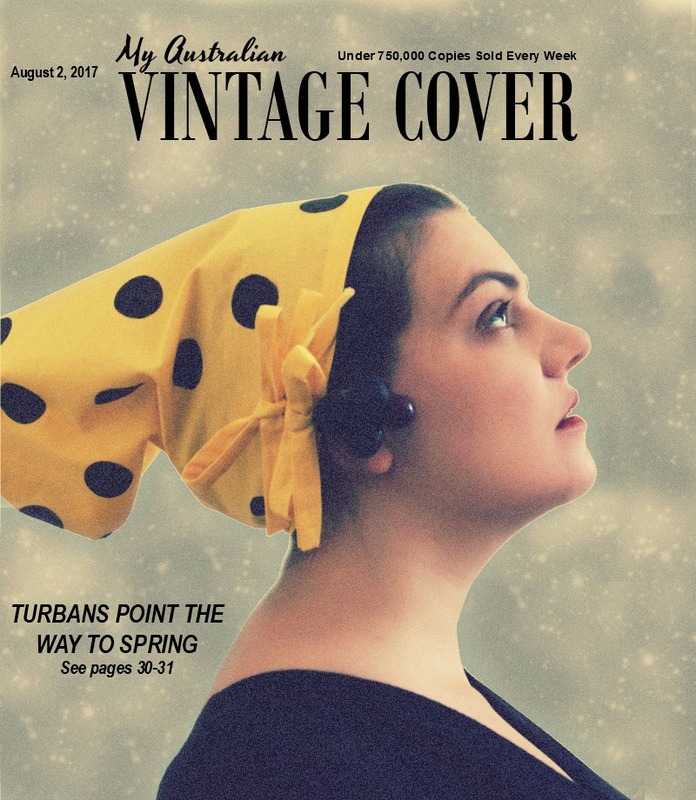 August is here, which means it's time for the My Vintage Cover challenge to begin. I thought I'd try to get one done early to get the ball rolling, and I hope to find time for one more before the month is out. Play to your strengths. 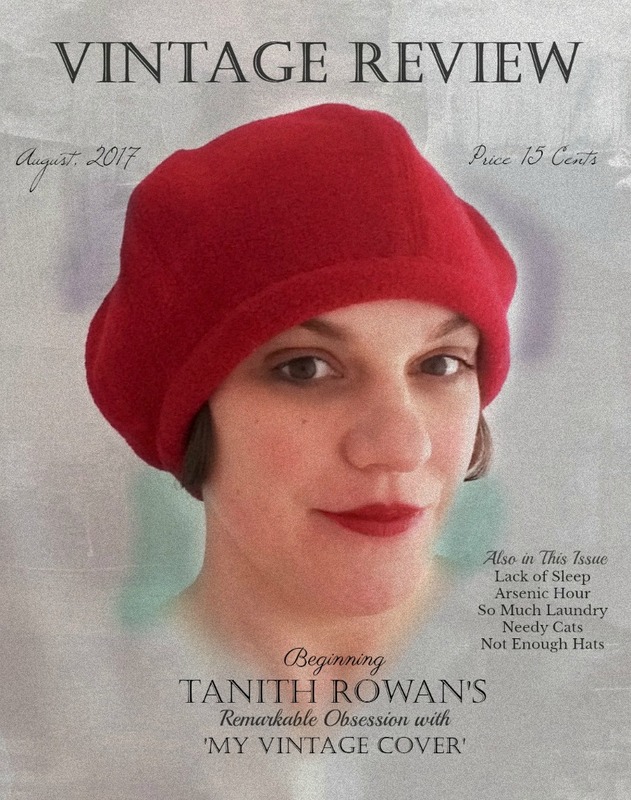 Actually I thought I was doing this, by choosing a cover that was just showing a hat, but I didn't consider that a facial close-up really would be best if you have make-up skills, and also don't mind directly comparing your profile to that of a model. The same pose will look different on you than the original model. I tried to achieve the same pose, but not only was it really hard, but it wasn't exactly flattering. I would have been better finding the best angle for me that was similar to the original. Make something useful. 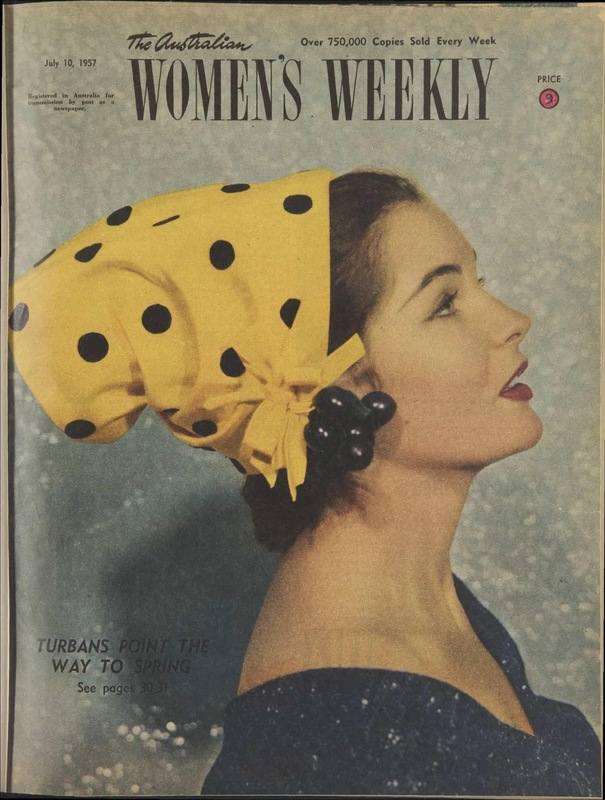 I really don't know why I chose a hat in yellow polka dots instead of something I (or anyone else) might actually ever wear. Oh well! Photo editing is the best thing ever. I HATED my photos when I took them, but the baby woke up so I worked with what I had. Editing makes soooo much difference. I really like the end result! If I attempt another cover, I will choose one that is shot from further away, and go for a generally similar look without worrying too much about high levels of accuracy. And there will probably be no polka dots.